Rabbi Joseph B. Soloveitchik (1903-1993) needs little introduction. Not only was he a descendant of a long line of distinguished rabbis. He was a recognized religious authority and prominent modern Orthodox thinker in his own right. From 1941 until his passing in 1993 Soloveitchik ("The Rav") served as head of Yeshiva University in New York. This reviewer has no problem evaluating this prayer book as an import contribution to contemporary religious literature. The translation by British Chief Rabbi Jonathan Saks is easily readable, and the textual commentary is broad in perspective and touching on many current issues. 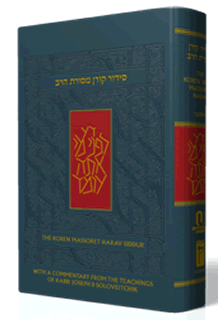 The siddur does not belong to any single stream of Orthodox Jewish thought. It is a mind-opening work for all who want to keep mitzvos and better understand prayers. A fascinating introduction to the book relates the customs of the Rav. Some of his minhagim are practiced widely. For example, he did not put on tefillin on the intermediate days of Succot and Passover. He stood during the entire Torah reading, since he viewed it as a re-enactment of Mount Sinai, where the Children of Israel stood and received the Torah. Many other practices are unique to the Rav, and there is extensive sourcing to explain background. He said the Traveler's Prayer even as he was preparing to leave and not only after he exited the city. "Although the Rav was a Levi, he would not wash the hands of the Cohanim, as it was his practice to stand with his feet together through the entire repetition of the Amida (18 Benedictions)." When someone is called to the Torah, the Rav felt that a Mi Shebrarach blessing should not be routinely recited after the reading, since "one may not request a reward for the performance of a mitzvah." On the other hand, however, the prayer may be said "if the person pledges to donate to charity" (see Talmud Bavli Rosh Hashana 4a). In our prayers we must concentrate, and in the Reader's Repetition of the Amida there is no exception. For that reason the Rav required that the Reader say the first three words of Modim then wait for the congregation to finish their parallel to the Reader's prayer before continuing. In that way everyone can pay full and undivided attention to the Reader. The sections of commentary that have been selected for this siddur show how the Rav thought carefully throughout our prayers. In Baruch She-Amar at the beginning of the morning recitation of Psalms we praise the Al-mighty, but later as we conclude those Psalms we recite, "May your name be praised by itself." Why the difference? According to the Rav, "We have just concluded expressing praise after praise, and have come to the realization that it is impossible for finite human beings to praise the Al-mighty properly." We must never be too sure of ourselves, "Even if one is rich, he prays for material sustenance; even if one enjoys robust health, he prays for healing. Man is vulnerable and his present blessings may disappear. There always lurks in the shadows the possibility of sudden reversal. The primary motivation for prayer is derived from man's feeling of vulnerability." We must never allow our prayers to become a matter of rote recitation, akin to turning on a tape machine. This siddur goes a long way to make us think about our prayers and understand them more deeply.